2018 Suzuki QuadSport Z90. Picture credits - Suzuki. Submit more pictures. 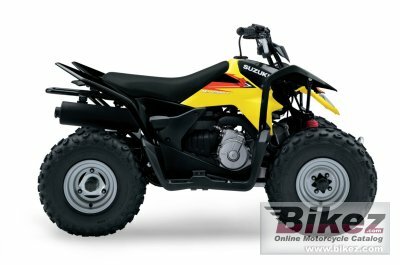 The 2018 Suzuki Z90 is the ideal ATV for adult-supervised riders age 12 and older to grow skills with. Convenient features like an automatic transmission and electric starter help make this ATV suitable for supervised riders ages 12 and up. An easy-to-set throttle limiter lets adults set the power level appropriately for young riders, and a keyed ignition switch makes sure there�s no unauthorized journeys. Price as new (MSRP): US$ 2949. Prices depend on country, taxes, accessories, etc. Factory warranty: 12-month, unlimited mileage, limited warranty. Ask questions Join the 18 Suzuki QuadSport Z90 discussion group or the general Suzuki discussion group. Bikez.biz has an efficient motorcycle classifieds. Ads are free. Click here to sell a used 2018 Suzuki QuadSport Z90 or advertise any other MC for sale. You can list all 2018 Suzuki QuadSport Z90 available and also sign up for e-mail notification when such bikes are advertised in the future. Bikez has a high number of users looking for used bikes. Before you buy this bike, you should view the list of related motorbikes Compare technical specs. Look at photos. And check out the rating of the bike's engine performance, repair costs, etc.